Ranking appropriately within search engines like Google and Bing is an integral piece of the modern digital marketing puzzle. But how can you tell if your site is optimized for search or if anything is holding you back? And if something is wrong, where and how should you focus your energy on fixes? Luckily, it’s relatively easy for business owners to self-diagnose SEO problems without costly tools or coding knowledge. Read on for five easy ways to determine whether you have a problem. What happens when you type in your business name, your products, or the types of services you offer into Google? Does your website appear on the first page of search results? More importantly, does your business appear above your competitors? If neither of these are true, it’s time to look under the hood and see what could be affecting your website’s organic search performance. 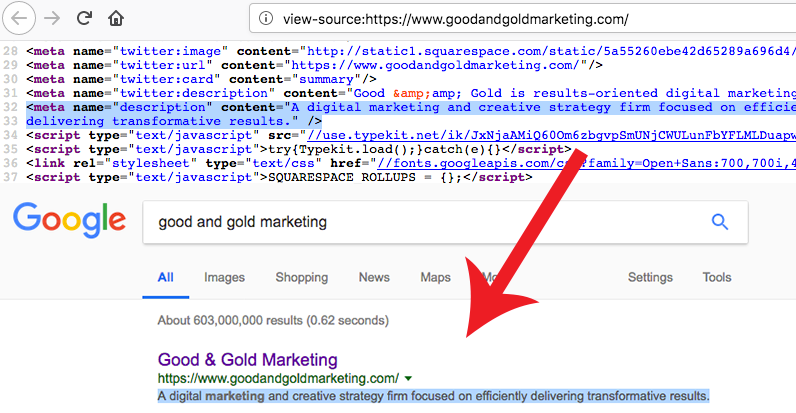 Meta tags are snippets of text that describe a web page’s content; data that often don't appear on a webpage itself, but do appear in search engine results pages (SERPs). They are generally placed in the “header” section of a page’s underlying code, and are a primary element that affects any website’s search performance. Meta Title: Meta titles specify the title of a web page, and are displayed on SERPs (and within social media feeds) as the clickable headline for a given result. The meta title of a web page is meant to be an accurate and concise description of that page's content. Google typically displays the first 50–60 characters of a meta title. Meta Description: Meta descriptions are HTML attributes that provide concise summaries of webpages, and appear underneath the green URL on a SERP entry. Depending on a user's query, Google might pull meta description text from other areas on your page. Google generally truncates meta descriptions to around 160 characters. Every page of your website should include these meta tags—without them, your website could be suppressed within search results, and searchers will be less likely to click through to your website. 4xx errors are a type of HTTP status code, which are three-digit codes that express a server’s response to a browser’s request. Any status code in the 200 range means the request was successfully completed—the server gave the browser the expected response. Meanwhile, a status code in the 400 range indicates a “client error”—the request was made, but the site or page couldn’t be reached because of an error on the website’s side of the conversation. Because a webpage’s ability to successfully load is a very important aspect of usability, too many 4xx errors can have a significant negative impact on your website’s search performance. So...how do you know if you’ve got a problem if these pages can’t be found? Simple. Use a handy tool like Screaming Frog’s SEO Spider to crawl your website for 4xx errors. So how do you fix 4xx errors once you find them? That’s where the hard work begins. One solution is to use a 301 redirect, or permanent redirect, to direct these URLs to another page, such as the homepage. But this isn’t a one-size-fits-all solution. Sometimes, it can pay to allow a page to return a 404 error so that it won’t be indexed and repeatedly crawled by search engines. Other errors require different, customized solutions to avoid confusing user experiences. If your site is rife with 4xx errors, it’s probably a sign you should get in touch with experts like us to create a tailored approach that pays off in the long term. For that reason, header tags should always include relevant keywords and provide a concise and accurate description of a page’s content. For example, if you were to view the source code for this webpage, you’ll see that the header tag is the title of this blog post. These sorts of page-level keywords are influential ranking factors for SEO, while they also enhance your website’s usability and accessibility. In other words, every page needs a high-quality header tag! Information Architecture (IA) is the organized design of how information is structured. And a well-organized website, of course, is crucial for creating a pleasant (and high-converting) user experience (UX). But it’s also an important factor for SEO. Not only must a website provide an intuitive, well-structured taxonomy of content and information, but the way your content is organized within each page can also boost your SEO and help search engines to interpret your pages. The best way to review information architecture is to take a look at your site map. Does it feel intuitive and easy to navigate. Is it a good representation of your business, and the scope of products and/or services you provide? As for content: Are pages structured consistently, with an easily understandable hierarchy? Does each page contain the appropriate keywords, with original, engaging, accurate, and grammatically precise copy? Not only will low-quality content drive away your audience, but websites with duplicate content, incorrect grammar, and false information rank poorly within search engines. If you’ve followed these five steps and found issues with your website, you’re not alone. And if you’re staring down a website with 1,000+ pages and can’t even fathom where to begin, worry not. Mastering SEO isn’t easy: Optimizing your website can be a gargantuan task, and the rules and tactics are always changing. That’s why we’re here! Want to talk about your SEO gaps and opportunities? Give us a shout!